Cascadia Windows & Doors has launched the world’s first fiberglass-framed window wall system. The Universal Series Window Wall marks an innovative step forward in energy efficient building technology, allowing architects and specifiers to substantially improve the overall thermal performance of commercial and high-rise buildings, without sacrificing windows size or glass area. The Universal Series Window Wall can improve a building’s thermal performance by 50 to 150 per cent, compared to traditional aluminum, largely due to the inherent thermal efficiency of the window wall’s fiberglass frame. 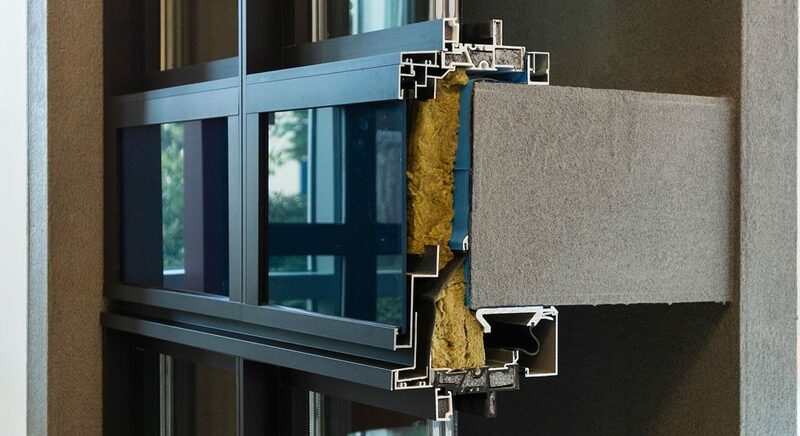 Available with both double and tripled paned glass, the window wall delivers R4 & R7 thermal performance, respectively, and leverages similar technology as the company’s Passive House Certified (U.S. and International) series of windows and doors. This designed-in-North-America system arrives at an opportune time for the construction industry. As more aggressive building codes come into effect across Canada and the U.S., the Cascadia team recognized architects and specifiers were finding themselves having to trade natural light and a more livable buildings for energy efficiency. Photo: Spandrel at slab bypass of new Aluminum-Fiberglass hybrid window wall by Cascadia Windows.